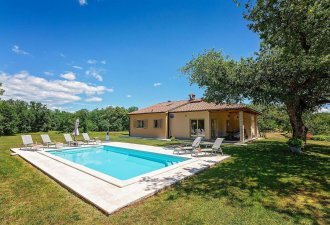 Casa Balarini is a cozy, typical istrian stone house located in the heart of the wooded and quiet village Sumber, only 9 km from Labin and 14 km from Rabac. Just across the street there is a shop and a children's playground, only 6 km away is the well-known rural household Pineta with autochthonous dishes and products. On partially enclosed property of 1000 sqm, the guests can use a private swimming pool of 32 sqm with 6 sun chairs and a sitting set, terrace with barbecue and three parking spaces. Holiday home of 120 sqm, on the ground floor there is a modern and fully equipped kitchen with dining table for 6 persons, living room with sofa and satellite TV, a bedroom with double bed and a shower/toilet. In the attic, accessible by small stairs, there is a bedroom with double bedroom, a bedroom with two single beds and a shower/toilet.